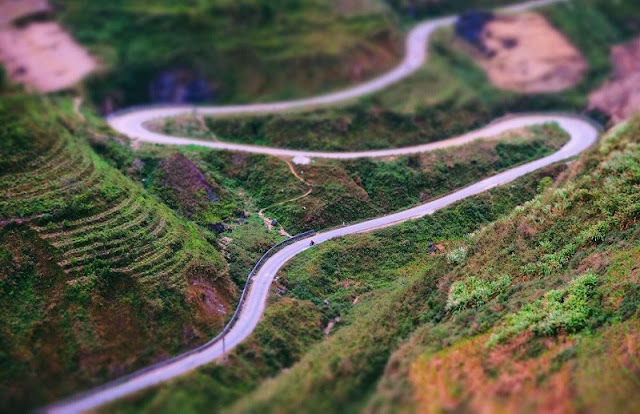 Ma Pi Leng is the name of the craggy stretch of mountainous road in Ha Giang province, about 20 km long, located on the Happy Road linking the Ha Giang town, Dong Van and Meo Vac districts. Ma Pi Leng in the language of Hmong people means "Horse nose" refering the abrupt mountain slopes. The road winding through the cliffs, passing Ma Pi Leng summit at an altitude of 2,000 meters, below is Nho Que river, light and thin as a thread. Ma Pi Leng pass is not too long however it is the most difficult pass in the remote north Vietnam, considered as King of passes in Vietnam, the pass was built by tens of thousands of workers from norther provinces in 11 months, at first the road was just wide enough for pedestrians and cycles then widened for the cars however it was still very difficult and dangerous with sharp bends and too narrow for two cars to pass from opposite directions. After completion, Ma Pi Leng pass with 9 curves over the sheer cliffs and deep abyss below has become a Great Wall of Vietnam. On top of the pass placed a stone tablet recording the construction of the road and also a monument to the contributions of those who have sacrificed their lives to make the road. The road is like a silk band winding the mountain with sheer cliff on one side and deep abyss on the other side is a challenge to adventurers, after crossing the slopes, visitors arrive at the Ma Pi Leng pass, amazed at the magnificent space of the mountain appearing in the blue sky, especially there is a piece of rock that comes out of the road is the place for you to have a panorama view of the mountainous north, visitors have a feeling like in the middle of the sky. With rugged terrain and spectacular unspoiled scenery, Ma Pi Leng pass deserves as one of the "Big Four Passes" of the northern region of Vietnam (with the Pha Din, O Quy Ho and Khau Pha Passes). 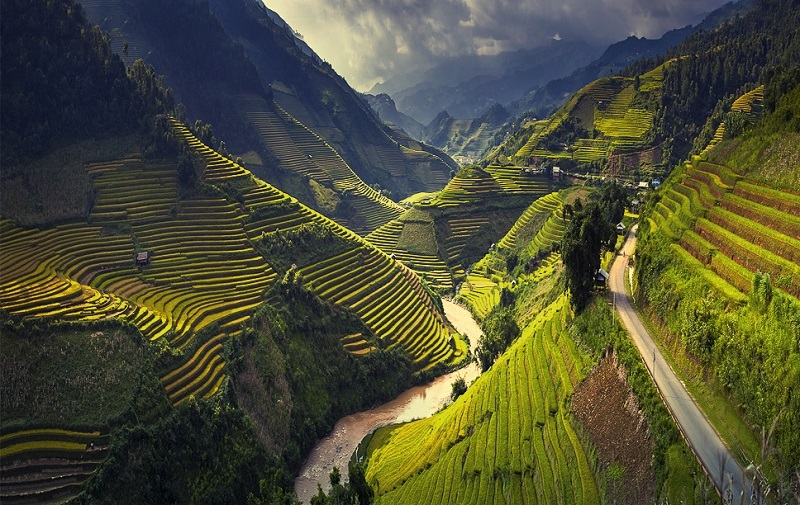 One cannot miss Ma Pi Leng pass when visit Ha Giang.